HARTFORD (April 9, 2011) – Heavyweight Tony “TNT” Grano got back on the winning track tonight in the main event on “The Willie Pep Boxing Classic,” presented by Hard Hittin’ Promotions, at the Connecticut Convention Center in Hartford. Grano improved his record to 18-2-1 (14 KOs) with a sixth round technical knockout of crafty veteran “Diamond” Dominique Alexander (20-11-1, 10 KOs). Grano dropped Alexander three times in the final round. In the co-feature, Meriden bantamweight prospect Danny Aquino (6-1, 2 KOs) turned in a very impressive performance, effectively working the body and then going upstairs to stop James Owens (4-3, 2 KOs) at 2:12 of the opening round. Aquino hurt Owens with a powerful left hook, trapping him on the ropes, and then unloading a barrage of punishing punches until referee Danny Schiavone signaled that the fight was over. Fan friendly East Hartford super featherweight Joseph “Chip” Perez’ unbeaten win streak ended at five when he was disqualified for hitting undefeated Esteban Nichol, who had been decked and was on one knee as the referee counted. Philadelphia light weight Frank Trader (8-0) kept his undefeated record intact, winning all six rounds en route to a unanimous decision victory against a game Tommy Atencio. Welterweight Shakha Moore won his first fight in nearly four years by way of a technical decision against Noel Garcia. The scheduled six-round bout was halted after four due to damages resulting from accidental head-butts by both fighters. 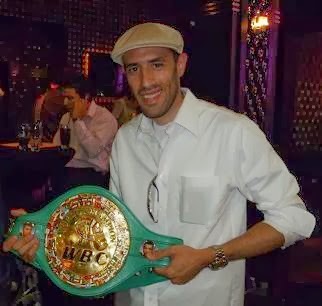 Hartford Mayor Pedro Segarra proclaimed Saturday, April 9, 2011 as Willie Pep Day in a special ceremony, in which the late Pep’s son, Billy, represented the family.